I'm so excited to be joining a wonderful group of bloggers for a 12 Days of Christmas tour! My mother loved Christmastime, and "The Twelve of Days of Christmas" was one of her favorite Christmas songs. I have many wonderful Christmas memories of my mom. She died at Thanksgiving 15 years ago, so I was especially glad to get to participate in this tour celebrating something she loved. 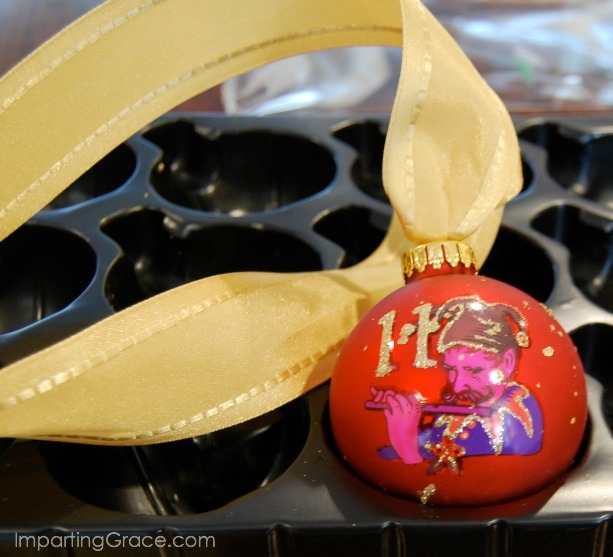 I was thrilled to find a set of 12 Days of Christmas ornaments made by Kurt Adler. Aren't they fun? I thought about hanging them on a special tabletop tree, but I changed my mind when I realized that there are 12 rows of window panes in my dining room windows. My dining room is full of things that belonged to my mom, so this seemed the perfect place to display the ornaments. and hung them all in a row. Man, it's hard to get a good photograph of windows! This primitive sideboard in front of the windows belonged to my mom. It's one of my favorite pieces. These blown glass ornaments were treasured by my mother. I love displaying them at Christmastime. My dining table and buffet were my mom's, too. The deacon's bench at the dining table is another of my favorite pieces. It's from my grandmother's church--the church in which my mom grew up. I have fond memories of visiting that church often during my childhood. The buffet is actually the bottom of a china cabinet. I grew tired of having the huge cabinet in the room, so I removed the hutch and use the bottom as a buffet. At the other end of the room are two built-in china cabinets, so I don't need the hutch for storage space. I love these lighted cabinets! 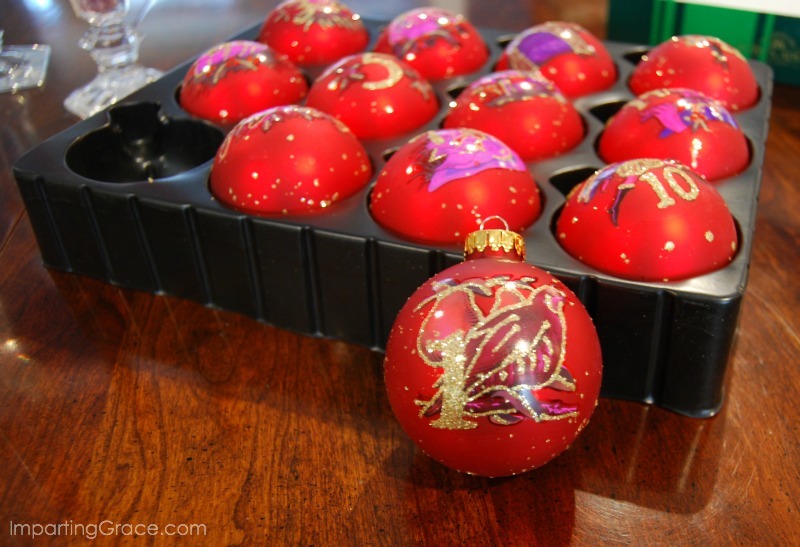 Here's one more shot of the 12 Days of Christmas ornaments. I love the way they add sentimental sparkle to these windows! For lots more Twelve Days of Christmas inspiration, you should check out all the stops on the tour. Your home looks so beautiful. 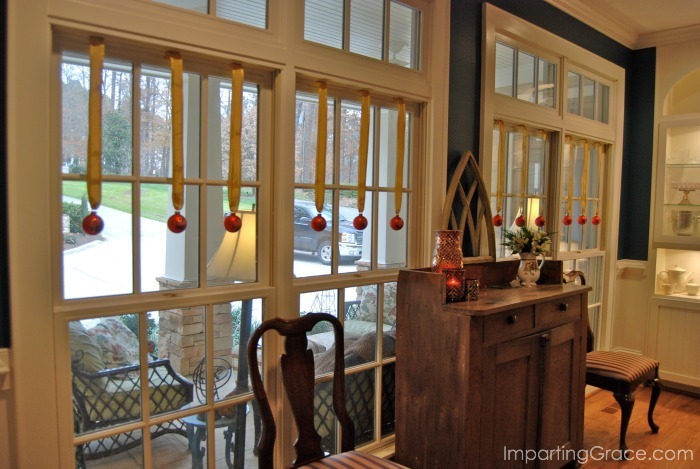 I love your interpretation for this project, the ornaments look stunning on your windows! 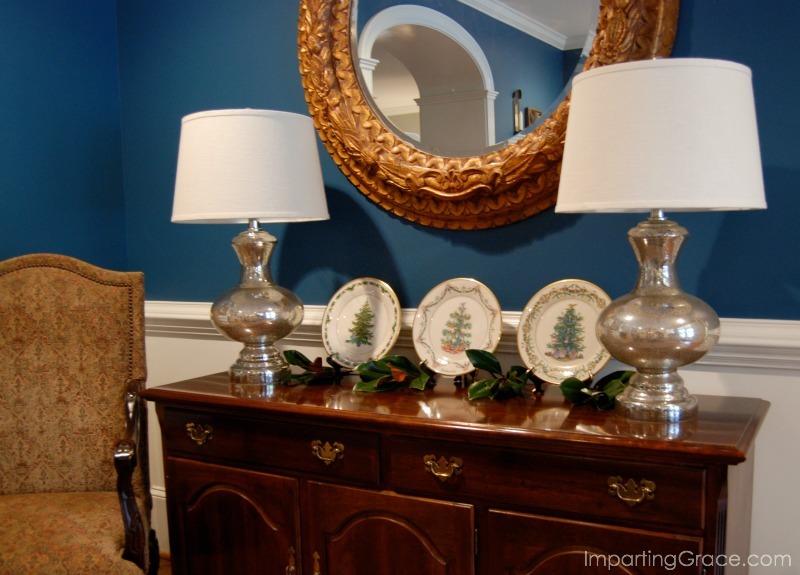 Your dining room looks fabulous decorated for Christmas. I love all of your mother's pieces and know that you feel that she is still with you when you see them each day in your dining room. 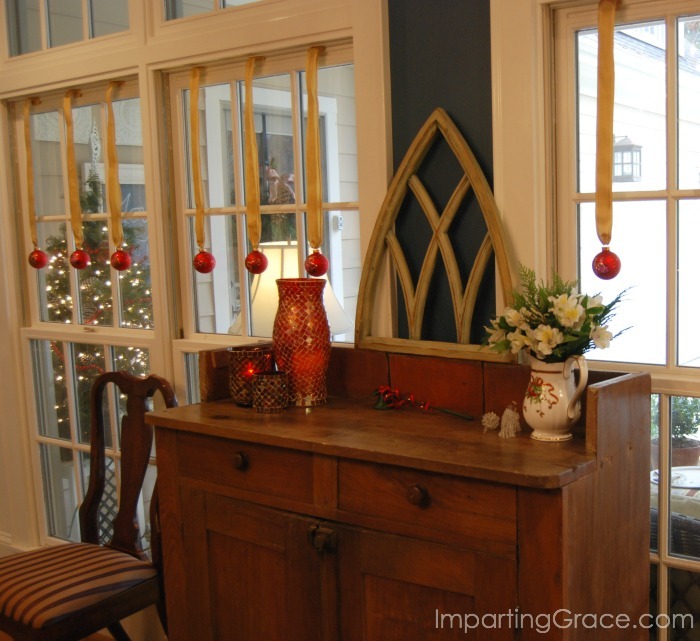 Your Twelve Days of Christmas ornament set looks perfect in your dining room windows. As always, I love how you decorate! Love the warmth and welcome feeling of your home! It reminds me of home and where I grew up. Your Mom's sideboard is a treasure..love that piece. Your post was such a beautiful way to tie in love, memories and cherished items. The ornaments are beautiful in your windows... Happy Holidays! 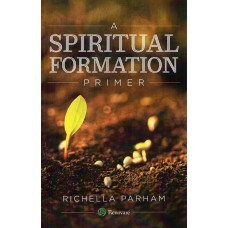 Richella, your home is so beautiful; and it just radiates love and warmth. I have many of my mother's pieces; and I love incorporating them into my decor. The holidays are the perfect time to reflect on all the warm memories and traditions that they loved! The ornaments look beautiful hanging in the windows. What a cute idea! 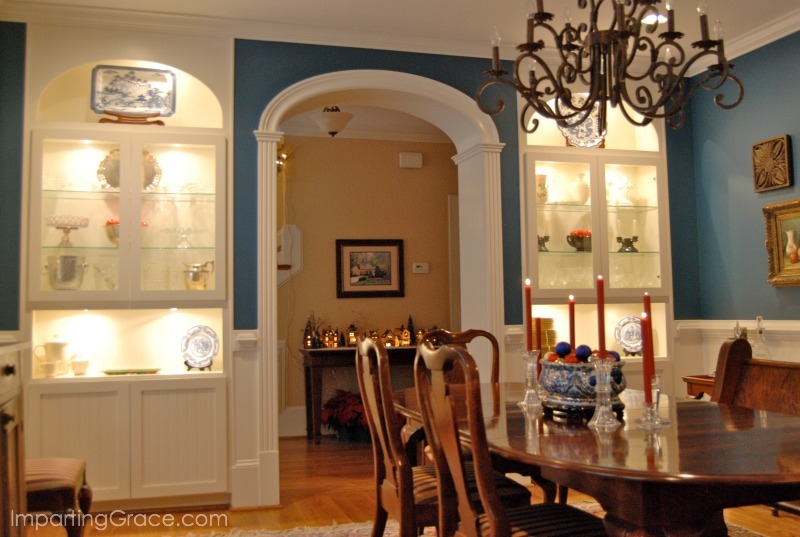 Your dining room is beautiful, Richella. I love the ornaments in the window. 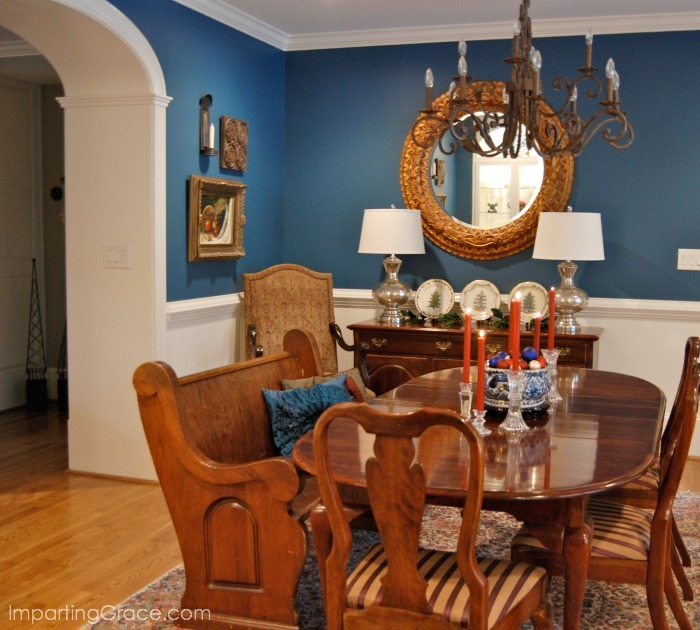 Richella your dining room is gorgeous!! I love how you have it filled with so many sentimental pieces...and I LOVE the ornaments hanging in the windows...so pretty!! Your home is beautiful!!!! I just love what you did with your day. The ornaments look so pretty hanging there! 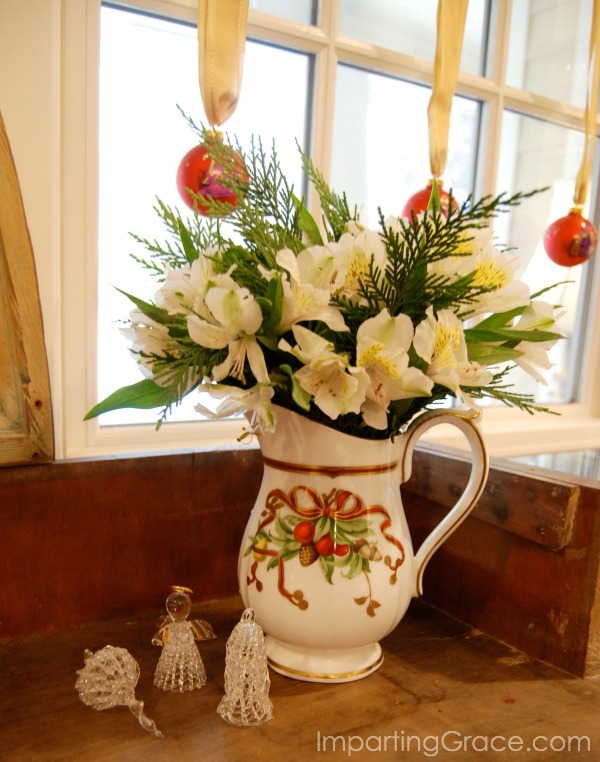 Your home is so lovely and warm and I love how you displayed your treasured ornaments! Gorgeous. The ornaments on your windows looks amazing. 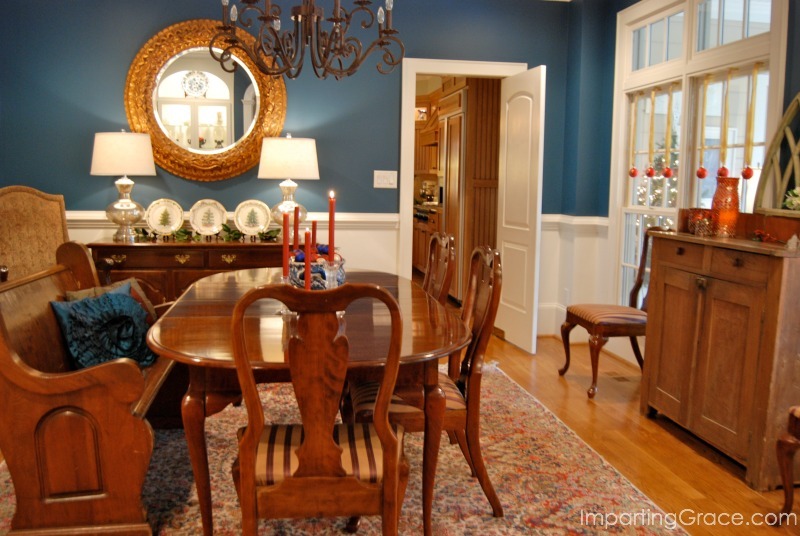 I love everything about your dining room! The gorgeous wall color ( reminds me of the accent wall in my living room) the beautiful furniture, the plates on the buffet, and of course the 12 Days ornaments. I love the way you hung them ( how did you attach them to the window?) but even more I love the sentimental history. What a blessing to have so many pieces that belonged to your mom. Love primitive style and your ornaments look amazing! Hello, What a lovely honor to be a part of this Christmas special! 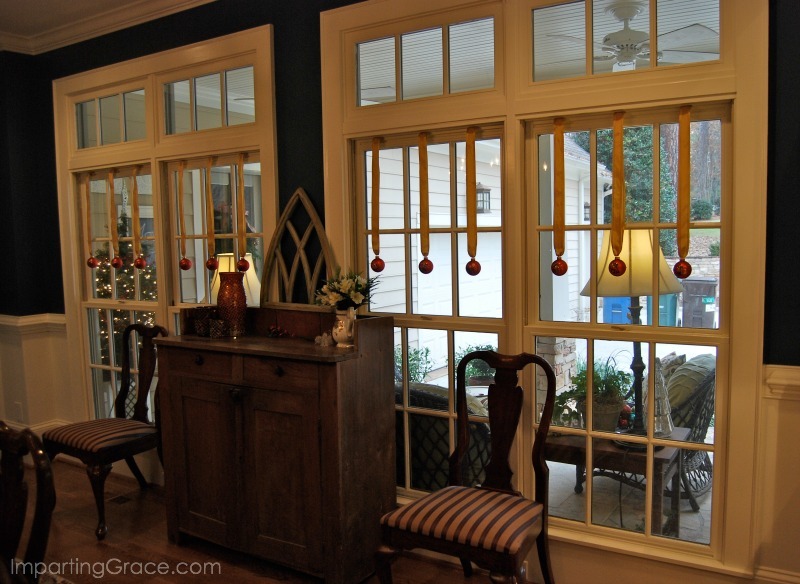 Love the 12 bulbs displayed in each window pane. Your Mother would love it also! Merry Christmas! I love the ornaments hanging! So pretty! So very beautiful Richella...love the ornaments hanging in the windows! They look beautiful, Richella, and that is such a sweet tribute to your mother. Your dining room is always so lovely.